Drain, rinse, & dry all of the chickpeas. I like to use flour sack towels, or paper towels to dry the chickpeas. Try to pat them dry so the skins don't come off too much, they will come off some though. Place Chickpeas on sheet tray with parchment paper, & place in the middle rack of the oven. Roast for 1-1 1/2 hours, tossing every 30 minutes (every 15 towards the end) until you achieve your desired crispiness. Remember the chickpeas will crisp up a bit more after you remove them from the oven. 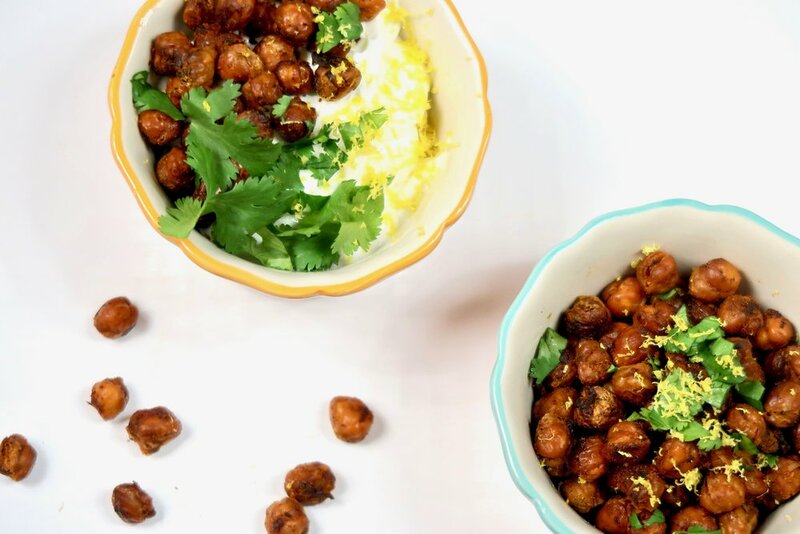 The amount of time usually depends of the amount of lemon juice added as well, so taste your chickpeas as you cook them. When your chickpeas are crispy remove from the oven, and let cool. Enjoy warm as a snack, or let them cool completely & place in a closed container in the pantry to enjoy later. I love these as a quick snack on the go, or over some greek yogurt w/some lemon juice, zest, & cilantro (even roasted sweet potato) for a play on granola. Depending how big of a batch I make, these never last longer then two days, but you can keep them in the pantry in a closed container (I love mason jars!) for up to a week.